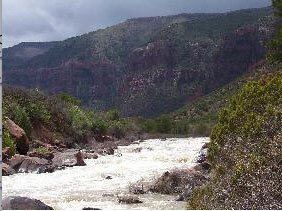 The Dolores River Monitoring and Recommendation team recently agreed on a plan to release water from the dam, which involved input from water managers, boaters, scientists, environmental groups, federal lands agencies, and local governments. Surplus water is expected to spill from the McPhee Dam from April 13 until mid-June, with 45 to 60 days of flow planned at 2,000 cubic feet per second. Water managers plan to release an even larger burst of water, expected at 4,000 cfs, during three days in late May (May 19-22). Scientists say the extra water will flush extra sediment downstream and create better habitat for native fish. Despite the extra water, water managers say all water allocations will be met, including those for agricultural use.